This fresh and delicious Melon Salad recipe is good any time of the year because melons are usually available throughout the year. You can use any melon, from casaba to Santa Claus, in this beautiful recipe. Make sure that you clean melons thoroughly before you cut into them to remove any bacteria that can hide int he webbed skin. Using a clean brush, scrub the melons under cool running water. Then cut into them and cube or ball the melon using a melon baller. Remember that all fruits and vegetables should be washed before you prepare or eat them. And try to find fresh mint for this recipe. Dried mint is a good substitute, but it doesn't have the same sweet flavor as fresh mint; dried is more concentrated and has a slightly smoky flavor. Serve this recipe as a side dish for any meal. In a small microwave-safe bowl, combine honey with sugar. Microwave on high power for 30 seconds; remove and stir. Microwave 30 seconds longer until sugar dissolves. Stir and let stand for 10 minutes. Add raspberry nectar or orange juice, lemon juice, and mint and mix well. 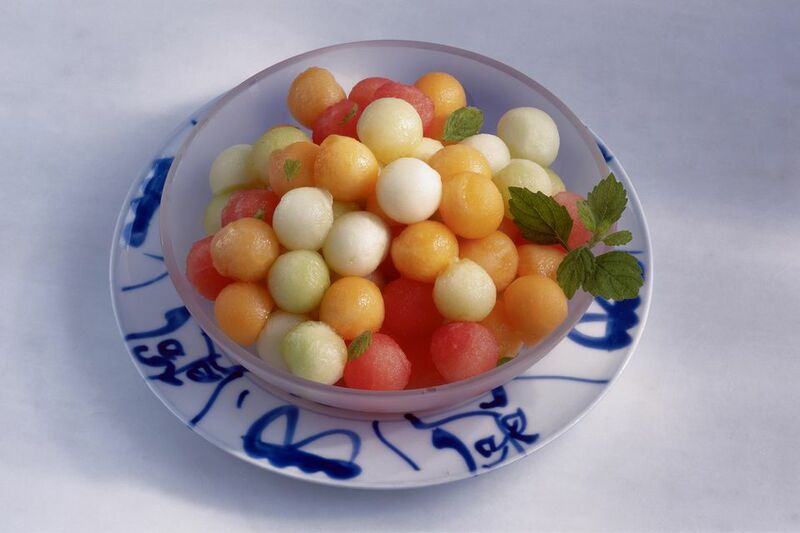 Place melon balls in a large serving bowl and pour honey mixture over. Toss gently to coat and serve immediately or cover and refrigerate until serving time.